The Milwaukee C18RAD-0 M18 right angle drill has a compact 100mm head designed to get all those jobs completed in the smallest of areas. it has a multi-position handle to allow for multiple hand positions and giving maximum user comfort. The 10mm single sleeve ratcheting chuck provides maximum universality and grip and has 10+1 electronic clutch which enables complete control while fastening. 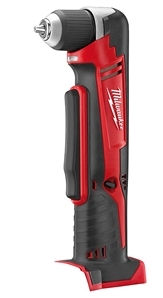 The new style Milwaukee Red lithium Ion style batteries come with a built in fuel gauge so you know exactly how much charge you have left for your job before the next charge is needed.